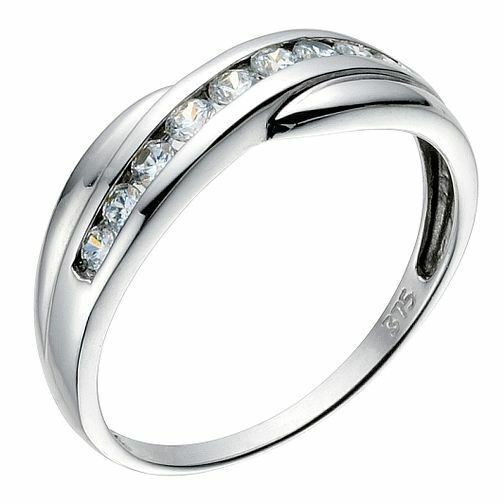 This 9ct white gold cross over eternity ring features channel set cubic zirconia. 9ct white gold cubic zirconia cross over eternity ring is rated 3.8 out of 5 by 4. Rated 4 out of 5 by Anonymous from light and airy I'm sure some person somewhere will like this ring. It is very light and delicate and you can feel it through the underside. Some people like to have a more robust feeling to the jewelry that they wear. Rated 5 out of 5 by Anonymous from The perfect gift I received this ring off my partner for a birthday present and it is absolutely perfect. I am not a fan of gold or thick bands, this is beautifully thin but not so that I feel that I am going to break it. I wouldn't change it for anything.